Creative Thinking. Digitally Printed Packaging. Packaging is no longer an exclusive market for offset and flexographic printing. Digital presses offer high quality, short runs, and prototype capabilities that reduce turnaround time and provide value-added features. A variety of print service providers (PSPs) utilize both digital and traditional printers. PSPs determine which method is best suited for each customer and job, with digital devices typically reserved for shorter runs. Creative Printing Company is a family-owned, certified woman-owned business that started in 1967 in Merriam, KS. With two employees it originally offered one- and two-color printing and foil stamping from a 5,000 square foot workspace. Over the past 50 years, the PSP expanded to operate in a 93,000 square foot facility with 50 employees. The company now provides a variety of printing services nationwide including UV, conventional, and specialty printing; folding carton and packaging; foil stamping; embossing; and assembly and fulfillment. It specializes in packaging and point of purchase (POP) creation. 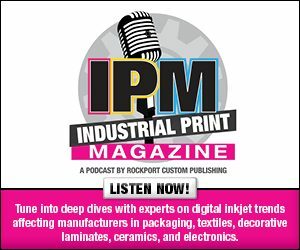 “Our growth has allowed us to continually invest in equipment and technologies to bring the most efficient production techniques and cost savings to our customers,” says David Leavey, VP, Creative Printing Company. The PSP services a variety of industries including ammunition, automotive, cosmetics, candy, clothing, electronics, food and beverage, household, medical, pet products, sports equipment, tobacco and vaping, and toys. In 2004, Creative Printing Company implemented digital printing technology due to increased customer demands for short runs, particularly with packaging. Today it uses the Fujifilm North America Corporation Acuity and Acuity F printers, as well as the HP Inc. Indigo 5900 Digital Press. “They all were chosen because of high-quality prints,” admits Leavey. Shortly after investing in digital technology, the PSP started to produce short runs and packaging samples. Today, 15 percent of its work is digitally printed packaging and prototypes, which according to Leavey, is a great way to allow clients to view and feel their package prior to committing to a large run. “We continue to see growth as digital allows us to produce high-end saleable packaging to allow for short runs,” he shares. Creative Printing Company’s packaging offering includes 4/6 corner, auto bottom, folding cartons, handle bag, pinch bottom bags, specialty packaging, straight-line, and windowing. The PSP’s folding carton and packaging services are available with in-house structural design, custom bags, and inline tape strips for sealing stay flats and packaging. Creative Printing Company also offers value-added features for packaging such as embossing, foil stamping, an inline barcode monitoring system, and adding coupons with in-house tipping. Carton folding is available from 65# cover stock to corrugated. Packaging is produced with a variety of materials like APET, corrugated, CCNB, SBS, SUS, and vinyl. Materials are selected based on customer needs and the products packaged. As high-quality, short-run packaging is one of the PSP’s leading services, it sees demands for short runs from all industries, including small businesses and digital marketing. “Startups and small businesses want to keep inventory low due to storage and changes that may develop as they see their product on market. We also see a huge digital market for promotions, meetings, seasonal, and special events,” offers Leavey. In addition to packaging, digitally printed POP displays are a large portion of Creative Printing Company’s business. With its digital presses, the PSP offers the ability to print and cut up to two inches thick, print up to 8×10 feet, and provide hard and corrugated displays. Its POP displays are produced on acrylic, corrugated, film, foam core, SBS, Sintra, static cling, and vinyl. In 2017, repeat customer Lee Jeans—a denim jean retailer—approached Creative Printing Company for a short-run packaging box that could mail to specific clients with its product. Designed in ArtiosCAD, a structural design surface program by Esko, black vinyl was applied to sheets of black corrugate and then printed with the Acuity F. 50 boxes were requested for the final run. The Acuity F inkjet printer produces a range of print applications at speeds of up to 1,668 square feet per minute. It features a 120.4×98.8-inch maximum print area, seven vacuum zones, automated printhead cleaning, and a UV-curing system for high-speed printing. The press is also available in a white ink configuration to further extend suitable applications and media ranges to include clear and colored substrates. Creative Printing Company finished the boxes with a Zünd digital cutter followed by hand assembly, this included forming the box so it was prepared for the client to place its product into it. From job submittal to assembly, it took the PSP five days to complete the project. The final result is a corrugated box featuring a hinged lid. According to Leavey, this job stands out from others because the customer requested a strike-through effect, which he says is typically completed with coating. Alternatively, Creative Printing Company used the material and the ink’s gloss to achieve a similar effect. “The client was very pleased and they placed additional orders for two similar designed packaging items,” he offers. Creative Printing Company relies on digital print technology to service the needs of its clients, especially when it comes to short-run, boutique-style projects. Its recent work for Lee Jeans is an ideal example of the capabilities afforded by digital printing.